Ahh Pinterest… I resisted for so long but last month I finally added the App to the front page of my iPhone/iPad Mini along with all the other Apps that I use daily. Flicking through the pins has become a bit of an addiction and given I have interests ranging from geekery to crafts on top of being a foodie, there’s never a shortage of stuff for me to repin. Pinterest addiction is not a bad thing at all though. So far it’s helped me be more pro-active about cooking things I see and like. I’ve tried many times to centralise ‘must-try’ recipes (online lists, scrapbooks etc.) but usually it’s a case of out of sight, out of mind. Cutting recipe clippings or bookmarking a webpage is one thing but reminding yourself to try a recipe is another matter. Pinterest has been an easy way for me to collate interesting recipes and since I check it everyday (at least once), it has so far worked well as a reminder for me to try something out and generally it’s been sooner rather than later. Anyway, one such recipe that grabbed me was crispy edamame or soy beans. It’s very simple and sounded utterly delicious. 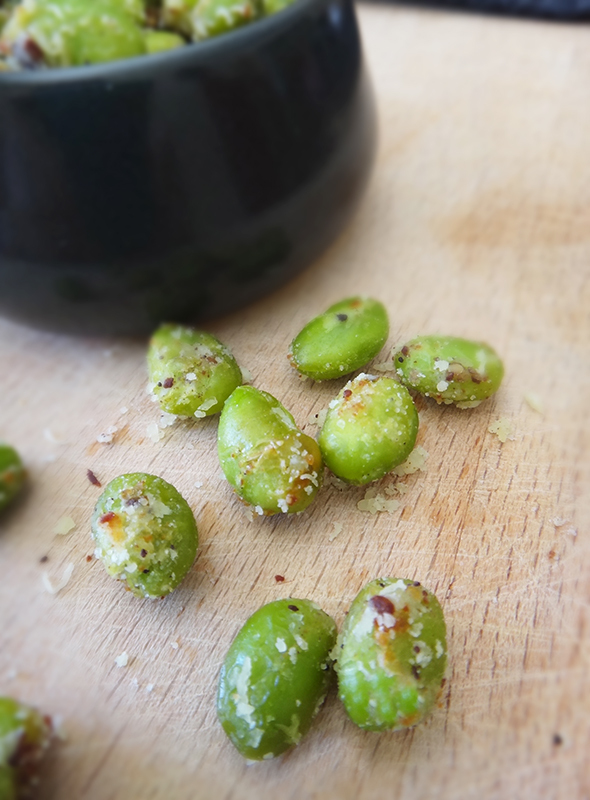 If you haven’t tried edamame before, it’s a very moreish and healthy treat. You usually get a bowl of boiled, salted edamame as a beer snack in Japanese bars. Packs of frozen, unshelled edamame are usually available at Asian grocers and they are inexpensive to boot. The original recipe is pretty straightforward but I made some changes (as you do…). Rather than sprinkling the Parmesan before baking, I decided to toss the cheese through the soy beans afterwards since Parmesan browns a bit too much for my liking in a hot oven. I also used green peppercorn which I think complements edamame better. This is such a lovely snack but I’m thinking these soy beans would also be great to add to a salad. Yay Pinterest! 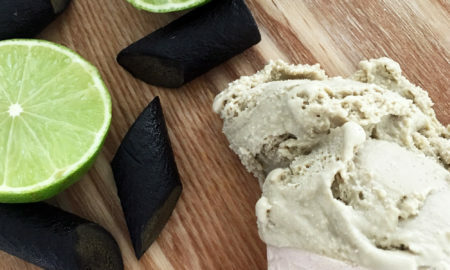 A tasty, healthy treat that is also quite inexpensive to prepare. Spread out edamame on a baking sheet lined with greaseproof paper and drizzle over with olive oil to coat. Sprinkle over peppercorn and salt and place into the oven, pre-heated to 200C. Bake edamame for 15 minutes, checking every so often that they are not getting too browned. Add Parmesan cheese and coat edamame well while hot. Where can you green peppercorn from? Makes a change from wasabi coated peas/chickpea etc etc! Sorry to hear! I will check my recipe but it sounds like you might have set your oven to 200 Fahrenheit whereas I use Celcius here in Australia. 350 F sounds about right though. Maybe even 400′ if you like them really crunchy. Just made these and they are wonderful! How do you keep them after baking.. refrig? Cabinet? 200 C is about 400 F. I’m going to give this a try, roasted vegetables have been my favorite lately. 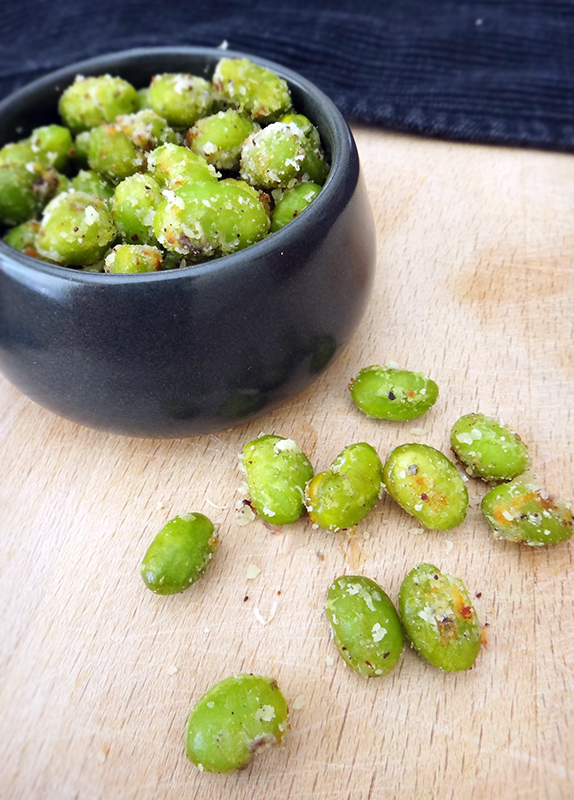 I love edamame, and with your recipe I love it even more. Also, Pinterest is great to rid excess paper. I pin the recipe (as I did yours) on my Kindle Fire, and open it when I cook in the kitchen….waa laa….no paper to lose. I have read your blog , really nice information you have shared.